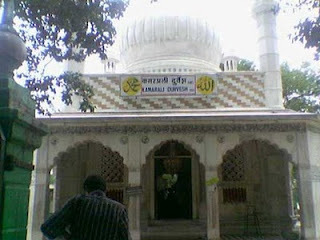 Kamar Ali Darvesh Dargah is situated in Shivapur, a small village around 16 km away from Pune city . This Dargah is visited by people belonging to all religions. The special feature of this Dargah is that it has two huge stones, which can lifted by reciting the sacred name of Kamar Ali Darvesh in one breath. Out of the two stones one can be lifted up by a group of seven people using just one finger each, with all the seven of them saying Kamar Ali Darvesh in one breath. The other stone can be lifted the same way, the only difference is the people in the group should be eleven. Though it may be spiritual or scientific, it still remains a mystery how it is possible to lift the stones. There is an 'Urus' or fair held at Shivapur once in a year. Road: Tourists can get down at Pune and then take a bus to this tiny village. There is airport and railway station at Pune . Pune is well connected by road with all the places in the state outside the state also and Regular bus service is available from Pune to Shivapur village. Raj Travels of Bus Tickets through Ticketgoose.com with simple money transaction procedures. Can also select seats, Book return Tickets and also cancel Tickets Online. TicketGoose ease the customers to book bus tickets through online bus reservation by walking into its channel partner outlet which includes Corporate Sectors and Ticketing Agents. . Many people feel that the Reservation of Bus Tickets ensures that their journey to Mumbai. This is the most populated city of India and ranks fifth among the world’s populated cities. The travels portals is the effective means to get Reservation of Bus Tickets. Travellers can resort to Reservation of Bus Tickets through different online travel portals of they wish to visit Mumbai with their near and dear ones. City Travels of Bus Tickets through Ticketgoose.com with simple money transaction procedures. Ticketgoose.com provides the best Online Bus Tickets Booking from chennai to bangalore,bangalore to coimbatore bangalore to hyderabad. Ticketgoose is trusted brand in Online Bus Reservation since 2007. Ticketgoose.com Launched in August 2007 has been a leader in Ticketing Web Portal for Book Bus Tickets Online.They operate over 3000 Destinations in South India and have collaboration with more than 250 Travel Agents. I have been there myself as a teenager, when we visited on a school picnic trip and participated in the lifting of the stone. With our group, the stone rose to the height of our shoulder as I remember. Other groups have been able to lift way above their heads. I am talking about my trip back in the 1960s. There were photos taken even back then the stone way above the heads of those who used their index finger to cause it to rise. It is all the power of the "chanting" of the name.